Gazpacho is a Spanish soup straight from the Spanish cuisine. Gazpacho prepares vegetables, oil, vinegar and bread. The soup is characterized by intense red colour and the presence of crumbs of bread and pieces of vegetables, eggs or other ingredients. 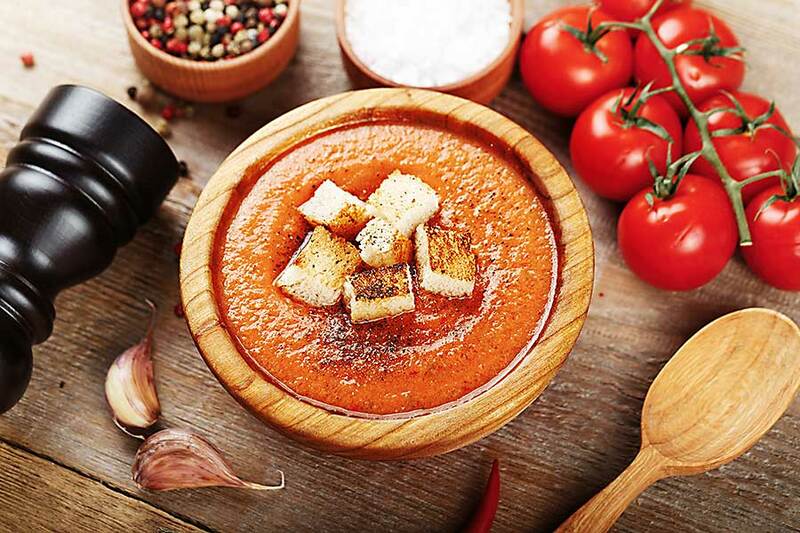 Gazpacho soup is mainly made of tomatoes and garlic, as well as soggy bread, vinegar and olive oil. Its characteristic feature is the intense red colour, which is the result of a large amount of very ripe tomatoes and sometimes also the addition of pepper. The dish was once eaten by the poorest inhabitants of Spain, and the preparation of the soup was very time-consuming, as all the ingredients were ground by hand in a mortar. Today, gazpacho food is in no way a determinant of the social class, and the preparation of the soup has become easy thanks to the use of blenders. 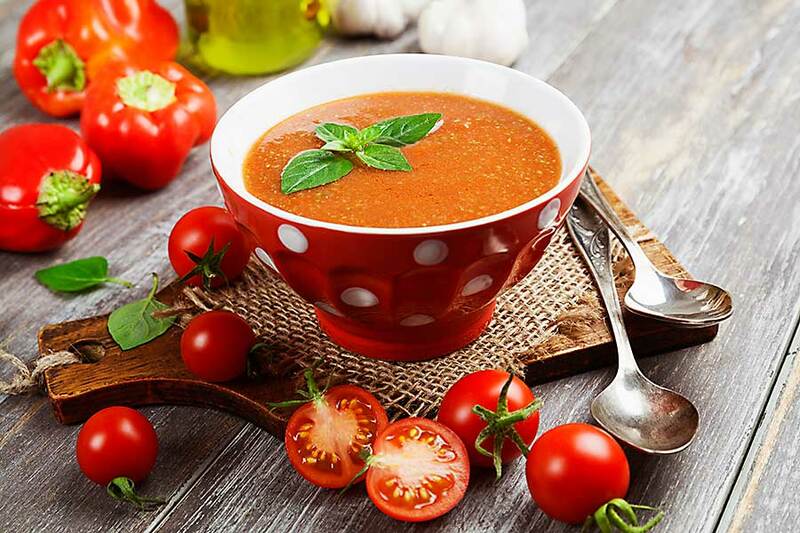 Gazpacho is prepared in many different versions, and the most popular ones are: Gazpacho Andaluz – they are prepared from very ripe tomatoes, peppers, garlic, green peas, bread, oil and vinegar. This version is the most popular of all. Salmorejo cordobas – in this version the first violins are played by tomatoes, and the obligatory ingredients are also eggs and ham. However, no water is added. Ajo Blanco – soup without tomatoes, but with almonds, garlic, bread and olive oil. Gazpacho tostada – the composition has orange and it is one of the few versions that is served hot. Gazpacho Porra – it is composed of serrano ham. Gazpacho Salmorejo – with the addition of tuna. Some versions assume that the ingredients must be completely chipped, and in others, they are in pieces. Gazpacho is served cold, in deep bowls or in tall glasses.